I have decided to place the beautiful R11 Machine for sale. Potential buyers must have picture ID. To prevent fraud. Contact: Martin Fischer/mrtnfischer@yahoo.com/ call 570 815 6294 or text me at that number. Located near Scranton, PA. It;s history with me included to showings in the AMCA For judging. The first showing was at the Sunshine Club in Daytona and the R11 received 96 out of 100 points. The 2nd showing of the R11 was at Rhinebeck, NY and it receiver 94 points. Major deductions were for the stainless steel bolts used in some of the coach work. Stainless was not available in 1933. The Machine starts and runs well. Today, 12/16/2013 money was transferred overseas to Turin, Italy for a Motorcycle for sale 1933 BMW R11, classic purchase. A great investment of long term value. Since BMW first began to manufacture motorcycles after the Great War, in 1924, their intent was to make a product that would sell for years to come. BMW had been making motors for airplanes and other motorcycle manufactures for many years. They would continue making engines and motorcycles and still to this day are noted for their durability. The R11 series was first made in 1929 and was produced till 1935 with a total of 75,000 being manufactures. It was the first to have the large 750cc engine horizontally opposed twin. This engine became a primary mover for BMW up through WWII. The R11 series was replaced with the R12 series which had the same size, side valve engine. Apparently the R11 type became a mainstay of the Wehrmacht as well as the R12 construction BASIS. 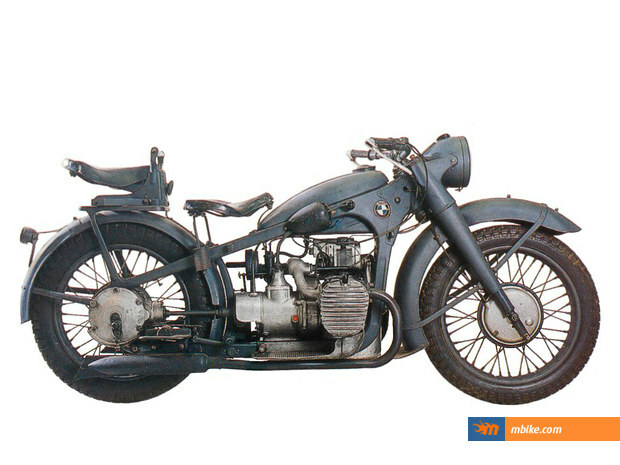 Not only was it a fast and reliable motorcycle for its time, many applauded the BMW traditional design as a “work of art”. charged of 250.00. The customs people, were happy to have seen the machine and the arrival fee from Federal express/Airport was $125.00. Shipping from Europe was $5,000 including the on site inspection, airfreight and total. As of December 6, 2013 the machine is in Turin Italy. The moto will transported by Stefan Knopf of www.knopftours.com, Heidelberg, Germany. Stefan took on the job of inspections, shipping and initiation of customs to USA. He was contracted by me after careful searching for some one to represent me in Italy. Stefan is the owner of a motorcycle tour group in Heidelberg, Germany. When it arrives in Daytona/Orlando. There the R11 will go the shop of Joe Gimpel, Daytona Beach, for inspection and and necessary upgrades and refinement. Because the R12 was constantly being changed during it’s production years, many different variants of the R11 were made. Only 5000 were produced. Arrival of the machine has occurred and it was cleared through customs at the Orlando airport. A arrival fee was charged of 250.00. The customs people, were happy to have seen the machine and the arrival fee from Federal express/Airport was $125.00. The R-11 was uncrated at the Orlando Airport, loaded on a trailer and than taken to Joe Gimple’s shop in Daytona. The bike was uncrated, gas was added, the oil checked and than started after a few cranks on the foot lever. In March, the machine was entered into the Antique Motorcycle judging at the AMCA, Sunshine chapter, Silver Sand Arena. In it’s class, the Machine received 96 points out of a possible 100. The discounts were for a poor weld on a foot rest and nickle bolts near the fender. The weld was fixed but the bolts remain. They look too good to throw away.. $4.00 in new bolts can get you close to perfect. Current Market value of this rare R11 is around $35,oo0 to $45,000 The machine is in secure storage in Pennsylvania. and can be shown with an appointment. Here is the work that was done to the bike in Italy on the rebuild as sent to me from Italy. I have responded with, how are all of the transmission and engine seals? I am happy you like my work. I can write all possible information about my work. You ask me where you can buy replacement parts of this motorcycle: I know there is a man in Germany, his name is DREHER who sell replacement parts but he has only some of this. If you need particular parts I can help you: some of my friends have something. If you need other information about the motorcycles write me, please! if you or your friends want to buy other motorcycles I send you some photo of motorcycles that I want sell. Notice that there is a air and oil suspension on the front forks as well as a lack of side shifter.